In April Durden Outdoor Displays added two digital billboard locations to its expanding digital network. 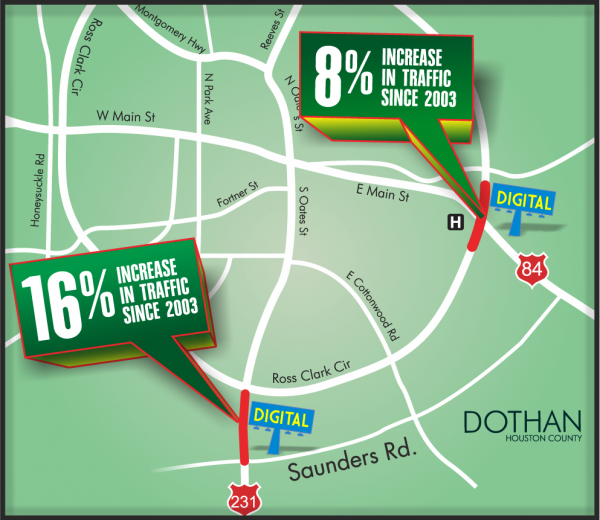 These new locations are in two of Dothan, Alabama’s fastest growing traffic areas – U.S. Highway 231 South at Saunders Road and U.S. Highway 84 East at Ross Clark Circle. These two locations were strategically chosen because of their high increase in daily traffic over the past several years. The segment of Highway 231 South between Ross Clark Circle and Saunders Road has seen a healthy 16 percent increase in traffic over the past 11 years to 33,610 per day. During this same time period Highway 84 East at Ross Clark Circle has seen a steady 8 percent increase in daily traffic. This popular intersection now boasts over 64,000 cars per day according to the Alabama Department of Transportation (ALDOT). Durden Outdoor Displays, Inc. is a local, privately owned firm which expanded from traditional billboards to high-tech digital displays in 2007. Over the last seven years Durden’s digital network has expanded to 27 locations spanning four Southeast Alabama counties. This network reaches more than one million cars daily. Durden Outdoor is the largest out-of-home media provider in nine Southeast Alabama counties with over 1000 faces. For an up-to-date traffic count map of the state of Alabama, please visit our web page. Season’s Greetings!!! Christmas is right around the corner and you are probably scrambling to find the right gift for that special someone, your best friend, your teenager, or even yourself. Well, there is no need to look any further. Toadlick Music Festival has tickets on sale for $89 until the end of December. On January 1st, the price will increase to $99, so ask for the gift of experience this Christmas (Yule, Kwanzaa, Saint Nicholas day, Las Posadas, or Hanukkah). You can see The Band Perry, Merle Haggard, Billy Currington, Aaron Lewis, Gary Allan, Clay Walker, Joe Nichols, Colt Ford, Jana Kramer, Brett Eldredge, Chase Rice, Gloriana, & more on April 24-26, 2014 at the National Peanut Festival Fairgrounds in Dothan, Alabama. Camping Passes & Toadally Important People (T.I.P) Passes are also available for the Holidays. You can get yours today by visiting toadlick.com for more details. And did we mention that 10% of all December ticket sales will be donated to the Wiregrass Area United Way Food Bank? That’s right; you can give back to your community while giving a gift to yourself. We hope you have a toadally awesome holiday! Ft Rucker – located at the Enterprise/Fort Rucker Gate, this display catches traffic heading west on Rucker BLVD. More than 16,000 vehicles pass this location daily and they are coming from the military base of Fort Rucker which has one of the highest hourly-rate wages in the state. Cube – “The Cube” is located on the corner of Hwy 84 and the Enterprise Bypass (Boll Weevil Circle). It has a captured audience at this intersection and sees more than 42,000 cars a day pass by!!! 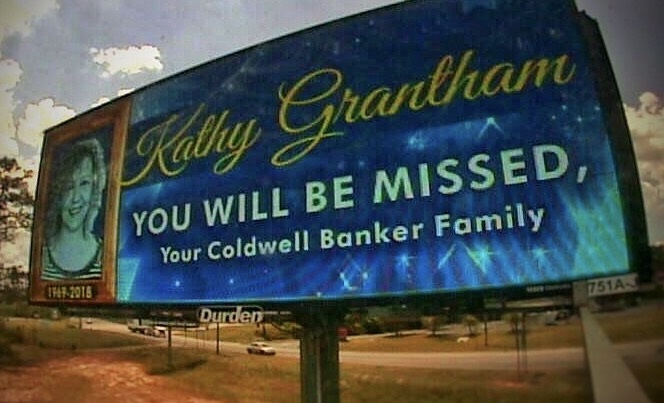 People traveling to Dothan from Enterprise and back are likely to see this highly visible display. Hwy 27S RHR – Hwy 27 South is part of a two-sided display located at the Publix shopping center in Enterprise. With more than 38,000 vehicles passing by here daily, your message is sure to be seen when you’re on either side of this prime location. Hwy 27N LHR – Hwy 27 North is the other side of the two-sided display located at the Publix shopping center in Enterprise. Again, with more than 38,000 vehicles passing by here daily, your message is sure to be seen when you’re on either side of this prime location. This side catches anyone heading towards Mellow Mushroom, Lowes and Highway 167 to Troy. *NEW* Hwy 167 S – Hwy 167 South is one of our newest family members and sits on the corner of Hwy 167 and the Boll Weevil Circle, located near ESCC. Nearly 16,000 cars daily pass by this location and that number is sure to increase with the growth going on on that side of town. 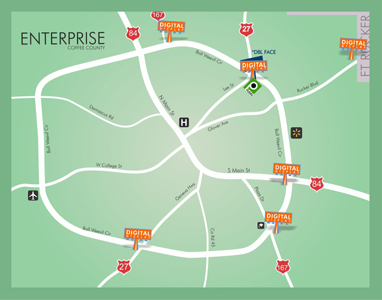 *NEW* Hwy 167 N – Hwy 167 North is also one of our newest additions to the Enterprise Digital family. Located on the Boll Weevil Circle and Hwy 167 North across from Lowes, this location is perfect for targeting traffic headed to Troy and the high school. *NEW* HWY 27S – This location is the third of three new locations Durden Outdoor has added to the Enterprise Digital Network. Located at the intersection of Boll Weevil Circle and Hwy 27 on the Southwest side of town, this display has a traffic count of more than 10,000 vehicles daily. With the growth that is occurring on this side of town, this location is soon to be a prime spot for your message to be seen. Durden Outdoor Displays is the only electronic, Outdoor-sign vendor able to accommodate an audience in the Wiregrass area with a network of unavoidable LED billboards – with many new electronic LED billboards going live in the coming months! Our current Network covering the Wiregrass consists of more than 20 digital billboards scattered throughout Dothan, Enterprise, Ozark and Eufaula and offers local advertisers multiple opportunities to get their brands up in lights! The Durden FAMOUS TEAM wanted to come out of the gate running in 2013! How could we get some attention on our digital billboards with self-promotional ads? We made it our personal goal to create content that would make drivers cringe, laugh, cry, sigh and give tribute. The teaser self promo simply said “2013 – THE YEAR OF THE SNAKE” with a huge bright green python’s face on the board. The ad played for almost three weeks on the entire DURDEN DIGITAL NETWORK in Dothan, Enterprise, Eufaula, and Ozark, Alabama. The verdict? Billboards definitely work! The traffic department at our company was filled with calls and emails about the “snake ad” playing on our Digital Network. We had originally planned on playing the teaser for a full 4 weeks. However, because of so many audience inquiries, we decided to go ahead and release the answer one week earlier. Today, we released the answer to the teaser which had an over lay on top of the snakes face saying “FAMOUS RULE #2 – Simple Ads Work”. Fact: Uncluttered billboards achieve greater success. We preach this over and over at Durden Outdoor Displays, Inc. because we know that it will work for any company. Your audience is zipping by at 45+ miles per hour and they only have about 6 seconds to notice, become engaged and process you message. Don’t make it difficult to reach your consumer by cramming your billboard with too much content. For simple ideas on how to make your marketing plan “HISS” in 2013, please contact the FAMOUS MAKERS at sales@durdenoutdoor.com or call us at 334-792-5056. The Digital Display located on Ross Clark Circle at Hwy 52 West is Durden’s 18th Digital Display and counting. Please contact Durden Outdoor Displays, Inc. today for more information on how we can make you FAMOUS! To reach an image consultant click here: Make Me Famous! or you may call 334-792-5056 to speak with a consultant directly. Please contact Durden Outdoor Displays, Inc. today for more information on how we can make you FAMOUS! To reach an image consultant click here: Make Me Famous! or you may call 334-792-5056 to speak with a consultant directly. Hillside Family Practice, one of Durden Outdoors more recent clients, has seen a significant increase in their patient numbers since using a combination of Rotary Poster Billboards along with our Enterprise Digital Network. “From August to November our numbers have increased. The majority of our new patients say they have seen the billboards with ‘Walk-ins Welcome’ and ‘Tired of waiting?” says Teresa with Hillside Family Practice of Enterprise. HFP started from the ground up with our Durden Creative Team designing their outdoor look. The art department put in many hours designing not only a campaign but Hillsides Current Logo. Dr. David Ryan was concerned with making sure the Enterprise drivers would know that it was a health clinic, they took walk-ins, and were quick to get you into see them. After many meetings and creative visions an outdoor campaign was settled on. This campaign was a great success for Dr Ryan, Hillside Family Practice, and the Durden Outdoor Team. We pride ourselves in serving our client in the best way possible. We are glad that we can continue with some form of the current message for Dr Ryan since it’s been working. Hillside is open Monday through Friday from 8:30am-5:00pm (closed for lunch 12-1pm). They accept all insurances except Tricare Prime and Medicaid Patient 1st. You can reach them at 334-475-2067 or visit them on 1008 Boll Weevil Circle Suite B, Enterprise, Alabama. If you are interested in trying an outdoor campaign with Durden Outdoor please contact us at (334) 792-5056 or sales@durdenoutdoor.com. We would love to being making you FAMOUS with our Digital Network, Bulletin Billboards, & Rotary Posters. Marine Lance Cpl. Jason N. Barfield, 22, of Ashford, Ala.; assigned to 3rd Combat Engineer Battalion, 1st Marine Division, I Marine Expeditionary Force, based at Marine Corps Air Ground Combat Center Twenty-nine Palms, Calif.; died Oct. 24 while conducting combat operations in Helmand Province, Afghanistan. The wiregrass area welcomed home a fallen hero, Lance Corporal Jason N. Barfield. Jason lost his life just over a week ago while serving our country in the war in the Middle East. The entire team at Durden Outdoor was honored to be able to participate in the Jason Barfield movement on Tuesday, November 1, 2011. We were able to create a memorial billboard to play on our Durden Dothan Digital Network in memory of Jason. Along with us, thousands of Dothan Area residents remembered Jason on the day of his arrival home. Ricky Stokes News was able to help communicate gathering opportunities to the public through his website. People gathered at Lowe’s parking lot where American flags were passed out. All along the circle our community gathered to watch Jason pass by them to his final resting place. WOOF Radio, FM 99.7, also reported on the route of Lance Corporal Jason N. Barfield’s procession as it left the airport and traveled to the funeral home. Thank you, Jason, for your service as well as all the other men and women who have given their lives fighting for our great country and everything we stand for.